In most U.S. post-war business cycles, recessions were followed by above trend growth in output and employment. After the last three recessions, however, output and employment growth were sluggish. … This paper shows that each of the last three recessions coincided with a collapsing bubble in a category of private fixed investment: commercial real estate (1990-91), internet equipment (2001), and housing (2008-09). From the Abstract, John Edwin Golob, Investment Bubbles and Jobless Slow-Growth Expansions: A Tale of Three Recoveries, Social Science Research Network, April 5, 2013. We have highlighted the two major subprime lending booms we’ve seen in that period — the subprime mortgage lending boom from 2003 to 2006, and the subprime auto loan boom from 2010 to 2014. … It appears that the key to boosting spending in the U.S. economy is subprime lending. Atif Mian and Amir Sufi, Subprime Lending Drives Spending, House of Debt, June 13, 2014. Investors have grown hungrier for higher-yielding assets in far-flung parts of the world, even if they’re more volatile, as yields on junk bonds have fallen to new lows. Lisa Abramowicz, Wall Street Clashes Over Emerging-Market Bonds as UBS Says Sell, Bloomberg, July 9, 2014. Bob Ivry, Complacency Breeds $2 Trillion of Junk as Sewage Funded, Bloomberg, July 8, 2014. Households can take on more debt as their wealth increases. With more borrowed money, households can purchase more goods and services. Thus, we can get job growth from wealth growth. But there is a hitch. The wealth growth that fuels job growth can be real or imaginary. When wealth growth is imaginary (speculative wealth bubbles), the new jobs created are unlikely to last. We saw this very dramatically in the housing bubble that preceded the financial crisis of 2008. U.S. job growth in that era floated on a chimera. It crashed with the evaporation of the chimera. Millions of people bid up home prices by buying them with the intention of holding them briefly and then reselling them for profit. But this could only work if, somewhere down the road, all of those speculatively purchased homes could be sold to families who wanted to buy them as homes, not investments, and who would pay the higher prices and could pay those higher prices with jobs and real incomes that would endure year after year for decades. As everyone knew, job and income growth in the U.S. had already been compromised by outsourcing, growing competition from companies in low wage parts of the world, and other changes associated with globalization. There was no reason to believe the future of real job and income growth in the U.S. would be better, so there was no rational basis for housing speculation. Why did it happen anyway? A good explanation is too many investors with too much money chasing too few real investment opportunities. Two decades of tax cuts for corporations and their wealthy owners (supply side economics) had pumped up the supply of investment capital far beyond the ability of the world economy to absorb it in productive ways. In addition, years of importing goods and services from China had turned China into holder of vast amount of investment dollars. The problem for people with vast amounts of money is that they can’t spend most of it on consumer goods and services and they can’t just put it in a mattress. They have to invest it. When there is too much money for the existing investment scene, they have to invent new investment opportunities. A whole industry grew up just for the purpose of inventing investment instruments with pretty faces and questionable (sometimes nonexistent) substance. Front and center was the packaging of imaginary housing wealth. Optimism about the economic scene is rising in the U.S. these days. Are we sure it is not rising on the surface of another speculative bubble? The relevant fundamentals have not changed since the early 2000s: The wealthy have even more wealth; taxes on corporations and the wealthy are still very low; neither U.S. nor global consumer demand are taking off. Debt in the U.S. is growing again – but on what economic basis? That is the key question. Best bet: the job growth we are seeing now should not be trusted. Posted on August 14, 2014 by Jim LundayPosted in Investors and Investments, U.S. Workforce TrendsTagged Employment Policy, Employment Trends, Global Job and Income Growth, Investment Trends. According to new statistics from the 2012 American Community Survey, engineering and computer, math and statistics majors had the largest share of graduates going into a STEM field with about half employed in a STEM occupation. Science majors had fewer of their graduates employed in STEM. About 26 percent of physical science majors; 15 percent of biological, environmental and agricultural sciences majors; 10 percent of psychology majors; and 7 percent of social science majors were employed in STEM. Census Bureau Reports Majority of STEM College Graduates Do Not Work in STEM Occupations, U.S. Census Bureau, July 2014. Since cohort-wage profiles display a similar pattern, these findings appear to fit with a strong increase in demand for cognitive tasks in the 1990s followed by a decline in the 2000s. 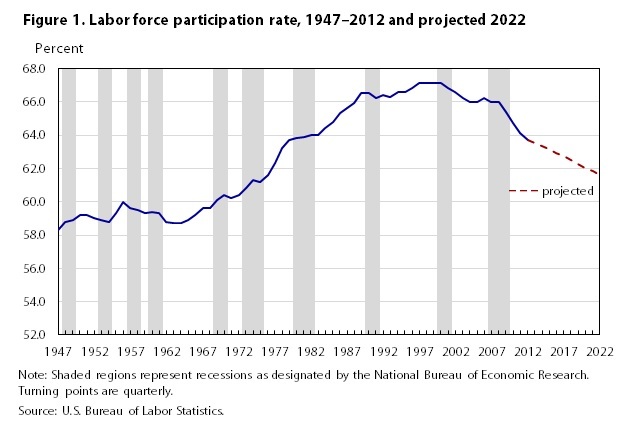 The labor force is anticipated to grow by 8.5 million, an annual growth rate of 0.5 percent, over the 2012–2022 period. The growth in the labor force during 2012–2022 is projected to be smaller than in the previous 10-year period, 2002–2012, when the labor force grew by 10.1 million, a 0.7-percent annual growth rate. We now live in a world economy in which economic processes and trends are global. Global economic growth is constrained and will continue to be into the foreseeable future. As a consequence, current patterns of investment, domestic and global, will not generate a sufficient number of jobs to produce anything near global full employment at living wages. Economic activity in the U.S. does not constitute a separate economy, so U.S. economy policies cannot produce full employment and high wages in the U.S. while the rest of the world is stuck with high rates of unemployment and low wages. Investment follows profits. Profits are maximized by producing in low income places in the world economy and selling in high income places. Unfettered transnational flows of capital and commodities combined with preventing low-skill working people from easily crossing national boundaries in search of work gives the world’s investors the legal framework with which to manage the world’s labor supply to their advantage. Posted on July 11, 2014 by Jim LundayPosted in Global Economic Governance, Global Workforce Development Forces, Global Workforce Trends, One World Economy, U.S. Employment Policy, U.S. Workforce TrendsTagged Employment, Employment Trends, Investment Trends, Job Growth, Skilled Workforce. Employers have long complained that graduates do not have the skills they need. A study released in November by Eurofound, the research arm of the European Union, showed that despite the recession, almost 40 percent of companies reported difficulty in finding workers with the right skills, compared with 37 percent in 2008 and 35 percent in 2005. The issue peaked last summer, when PayPal’s chief executive in Ireland, Louise Phelan, stoked controversy by acknowledging that the company had recruited from 19 other countries for 500 positions in its operations center in Dundalk because of a lack of foreign-language skills among Irish nationals. This summer, Fujitsu, which employs 800 people in Ireland, revealed that it had had to hire most of its Ph.D.-level experts from abroad. Liz Alderman, Unemployed in Europe Stymied by Lack of Technology Skills, New York Times, January 3, 2014. What is the right wage for a business facing stiff global competition: the lowest wage, of course! Note the last paragraph above. Apparently, PayPal and Fujitsu did get the workers they needed. It’s a possibility that corporate CEO’s are extremely unlikely to say to a host country like Ireland, “We like your low taxes here, but we can import cheaper workers from other countries — and we will.” Isn’t it very likely that the real issue for corporate leaders is that the hourly wages of educated workers in more affluent countries are not the lowest wages they can pay and still be successful? My bet is that CEOs present the issue as a labor supply problem (skills shortage) as political cover and to shift the cause of high unemployment (even for well educated workers) onto the workers themselves and away from the corporations that are making the actual hiring and firing decisions. My bet is that the world economy actually has plenty of well educated and skilled workers, but the world’s corporations are producing too few jobs to employ them all. They just won’t ‘fess up. Posted on January 5, 2014 by Jim LundayPosted in Economists and Economics, Global Workforce Development Forces, U.S. Workforce TrendsTagged Employment and Income Insecurity, Investment Trends, Labor Markets, Unemployment. With five cameras, a sonar sensor that detects motion 360 degrees around it, and enough intelligence to learn tasks within an hour, Baxter is designed to work safely alongside humans and do simple jobs such as picking items off a conveyor belt. It’s also cheap enough, at $22,000 a unit, so that the investment math works: If Baxter performs three years of eight-hour shifts, it’s the equivalent of labor at $4 an hour … To teach Baxter a job, a human simply grabs its arms, simulates the desired task, and presses a button to set the pattern. Brad Stone,Smarter Robots, With No Wage Demands, Bloomberg BusinessWeek, September 18, 2012. Anyone who endured Macroeconomics 101 was taught that recessions and depressions occur because of insufficient demand or from overproduction and a general glut of things that no one can buy. This explains the still popular Washington economic cure, which involves artificially generating more economic demand via federal outlays. The opposite perspective emerges from Say’s Law (named after Jean-Baptiste Say): the proposition that supply creates its own demand when economies are unshackled. Wayne Crews, Stimulating Demand Misses the Point, Forbes Magazine, September 26, 2011. Now that we are so far away from the trauma of 2008, experts generally agree that policies haven’t worked as expected – but they continue to hope that GDP growth will produce massive job growth. That hope is based on a shared belief that increases in GDP require equivalent increases in job growth. The two sides offer competing formulas for stimulating GDP growth, but both rest on this belief. Liberals call for increasing consumer demand (demand side economics), which in turn should generate more investment and more jobs. Conservatives call for increasing investor funds (supply side economics), which in turn should increase hiring and then generate more consumer demand. Both formulas end up in the same place: high GDP growth and a low unemployment rate. The key connection for both formulas is the belief that the production of commodities that will be sold in markets is primarily dependent on human activity. More production requires more human activity. Well into the 20th century this belief had considerable validity. It no longer does. Machine activities have replaced large portions of human activity in the production of commodities for sale in markets, and more machines are being brought on line every day around the world. Increasingly, machines are not only replacing physical production activities (like assembly line tasks), they are replacing information gathering and decision-making tasks. In this context, the old formulas for job growth don’t work. A large amount of investment in buildings and machines produces only a tiny amount of job growth. In the 21st century, jobs must be created intentionally, not as a byproduct of investment growth or demand growth. Competing companies can’t do that kind of intentional job creation without putting themselves out of business. Only governments can intentionally create jobs. Posted on December 26, 2012 by Jim LundayPosted in Global Workforce Trends, U.S. Workforce Development PolicyTagged Employment, Employment Policy, Investment Trends. But it is no accident that so many of the world’s economies are sputtering at the same time, or that so many people around the globe are angry. … One reason for the synchronized gloom, of course, is the synchronization of the global economy. … Rather, we are all, both together and apart, trying to figure out three big questions. … The first is how nation-states fit into a globalized world economy. Chrystia Freeland, The three questions of global importance, Reuters, June 21, 2012. Stephen S. Roach, The Great American Mirage, Project Syndicate, June 27, 2012. J. Bradford DeLong, The Perils of Prophecy, Project Syndicate, June 27, 2012. If we are to thrive as a global community of almost 10 billion – the projected population by 2050 – these new models are not optional, they are an absolute necessity. From the Introduction, Outlook on the Global Agenda 2012, World Economic Forum. As a world economic crisis developed in 2008 and lasted longer than most economists predicted, it became increasingly clear that beliefs about macroeconomics and macroeconomic policy needed to be thoroughly examined. … By the end of this fascinating conference, we knew that we had entered a brave new world and that the crisis is generating enough questions to fill our research agendas for years to come. From the Preface: Olivier J. Blanchard, David Romer, A. Michael Spence and Joseph E. Stiglitz, In the Wake of the Crisis: Leading Economists Reassess Economic Policy, MIT Press, 2012. Jeff Sommer, Flights to Safety Can’t Hide the Dangers, New York Times, May 12, 2012. A significant number of economists and policy experts have wondered whether this global economic crisis is different – for two reasons: very few experts saw such a severe crisis coming and, even after absorbing that surprise, very few expected the crisis to be so resistant to policy interventions and to persist for so long. The global spread of advances in productive technology, which entails the substitution of machine energy for human energy and machine thinking for human thinking, is slowing the growth of demand for goods and services by reducing opportunities to gain income through work. This confluence emerged in recent decades and has permanently damaged the capacity of the world economy to generate the large pulses of consumer demand that historically called forth the productive investment responses that produced pulses of demand for labor. The pulses of demand for labor increased wages and moved families from the ranks of the poor into the ranks of the middle class. Over the longer term, more wealth was also pumped into the hands of the people at the top, preparing those people to respond to the next pulse of consumer demand. Today, there is no mechanism for generating that heartbeat of economic growth. The confluence of forces has damaged both phases of the cycle. On the demand side, the first response to the confluence was a massive increase in global debt levels. Debt growth sustained the growth of demand. However, debt growth had to come to an end. Today, with global debt levels very high and with global corporations wielding enormous political power in the world economy, it is not politically feasible to generate a Keynesian pulse of global consumer demand (either by massively expanding global debt levels or by redistributing a large amount of wealth from the affluent to the have-nots). But, even if the world economy’s leaders did find a way to generate a large pulse of consumer demand, it would largely fail to restart world economic growth. On the supply side, the productive investment responses to a large pulse of consumer demand can no longer produce the employment and income gains that they produced in the past. The ratio of machine energy to human energy in the world economy is so high now that demand for labor would not increase sufficiently to drive up global wage levels to the degree that was the case in the past. Moreover, and more importantly for the long run, increasing the production of goods and services in the context of a world of resource limits that are becoming more difficult to overcome will drive up consumer prices. Whatever wage gains are realized will be offset by a higher cost of living..
From time to time in the history of the capitalist world economy, its magic has faltered and then been restored. This time the magic will sporadically flicker on for a while here and there in the world economy, but it will not be restored. Something else will happen. Posted on July 5, 2012 by Jim LundayPosted in Global Economic Growth Limits, Global GDP Growth, Global Workforce Trends, Technology and Global ProductivityTagged Economic Crises, Employment Trends, Global Corporations, Investment Trends, Technology. Last week Amazon, the online retailer, announced it was buying a robot maker called Kiva Systems for $775 million in cash. … Kiva Systems’ orange robots are designed to move around warehouses and stock shelves. Nick Bilton, Disruptions: At Amazon, the Robot World Comes a Little Closer, New York Times, March 25, 2012. The value of the global industrial robot-system market will double to $41 billion by 2020, according to an estimate by Christine Wang, an analyst at Daiwa Capital Markets in Hong Kong. Global unit sales last year jumped about 30 percent to a record 150,000 units, the IFR said. Reuter, the Kuka CEO, said higher wages in China make investing in robots a simple trade off. Richard Weiss, Kuka Robots Invade China as Wage Gains Put Machines Over Workers, Bloomberg, April 12, 2012. This is the potential of the “Internet of Things”: billions and billions of devices and their components connected to one another via the Internet. 50 billion devices by 2020, according to companies like Ericsson. The basic building block of the Internet of Things is machine-to-machine communication (M2M), devices equipped to communicate without the intervention of humans. Large scale M2M users may offer their services dozens of countries, selling the same devices globally. Rudolf Van der Berg, The Internet of things, OECD Insights, January 31, 2012. IBM says Watson’s skills — interpreting queries in natural language, consulting vast volumes of unstructured information quickly, and answering questions with a defined level of confidence — can be applied to many industries. It has already sold the technology to WellPoint Inc. (WLP), the U.S. insurer, and Citigroup Inc. (C), and expects to generate billions in new revenue by 2015 from putting Watson to work. Beth Jinks, IBM’s Watson to Help Memorial Sloan-Kettering With Cancer, Bloomberg, March 22, 2012. There is reason to believe that code kernels for the first Turing-intelligent machine have already been written. Brandon Keim, Artificial Intelligence Could Be on Brink of Passing Turing Test, Wired, April 12, 2012. The prevailing U.S. policy approach to creating jobs and distributing income reflects the traditional optimism of economists about long term employment and income distribution trends. It treats employment growth and the widespread distribution of income through private sector payrolls as beneficial side effects of economic growth that require little attention from government. The primary concern for government is providing optimal conditions for private sector investment. The general optimism of economists about employment and income distribution includes a specific optimism about the impact of technology driven productivity growth. Economists generally acknowledge that the implementation of new production technologies reduces the demand for labor in the industries in which those technologies are introduced. But, they go on to argue that the workers who are displaced (or their children) find work in new industries (also created by the new technologies). The net result is greater wealth for society and no permanent upward trend in unemployment. In the past, this logic worked fairly well in the U.S. Today, however, three key assumptions underlying this logic are violated in the real world. The first assumption is that technological innovations will not be implemented faster than displaced workers can retrain for and find alternative work in emerging industries. This assumption is no longer operative because unprecedented efficiencies in research and development fields, unprecedented fluidity of capital flows, and unprecedented levels of global competition are generating employment displacement and new skill requirements faster than human institutions can respond. The second is that global market institutions will always evolve fast enough to keep the global capacity to consume growing as fast as the global capacity to produce grows. The expanding role of debt financed consumption in the growth of global markets in recent decades and the prolonged duration of the financial and economic crisis that began in 2008 because of the tightening of credit show that this assumption is at least questionable. The third assumption is that machines can displace only a small portion of human work activity. This is no longer true. Recent years have brought businesses massive increases in computing power, lower cost high capacity information storage, and computer programs that use highly sophisticated computational algorithms. These hardware and software advances are now being deployed to mimic an expanding range of human work activities. If the assumptions on which economists rest their optimism about employment growth and income distribution are now obsolete, then public policies that succeed in stimulating private sector investment growth are unlikely to produce the employment growth and income distribution outcomes needed by the majority of people. Creating good jobs and implementing policies that widely distribute incomes must become direct goals of government policy making, rather than secondary goals. To continue with the current focus only on providing optimal conditions for private sector investment will only bring us more of what we now have: declining middle class incomes, more families living in poverty, and too much wealth owned and controlled by too few people. Posted on April 17, 2012 by Jim LundayPosted in Global Job Creation, Global Workforce Trends, Technology and Global Productivity, U.S. Workforce TrendsTagged Employment Policy, Employment Trends, Investment Trends, Private Sector. Christine Hauser, S.&P. 500 at Highest Close Since ’08, New York Times, February 24, 2012. Martin Hutchinson, U.S. stock bubble is in profit, not value metrics, Reuters Breakingviews, March 5, 2012. Steven M. Davidoff, Tax Policy Change Would Bring Cash Piles Abroad Back Home, New York Times, August 16, 2011. Chen Jia, Economic growth could slow further, China Daily, March 23, 2012. Brian Keeley, How Slow Will China Go?,OECD Insights, March 21, 2012. The difficulties in the euro area have affected the U.S. economy. … In addition, weaker demand from Europe has slowed growth in other economies, which has also lowered foreign demand for our products. Ben S. Bernanke, The European Economic and Financial Situation, Testimony Before the Committee on Government Oversight and Reform, U.S. House of Representatives, Washington, D.C., March 21, 2012. A main indicator of business sentiment in Europe unexpectedly fell deeper toward recession territory Thursday, compounding concerns about the global recovery after signs of slowing manufacturing in China. Jack Ewing and Bettina Wasserner: Indicators Fall in China and Europe, New York Times, March 22, 2012. U.S. job growth is becoming more vulnerable to economic troubles that develop beyond the borders of the U.S. because U.S. corporations increasingly earn their profits in multiple regions of the world economy, perhaps not even primarily in the U.S. This trend can be expected to continue as high end manufacturing, investments in science and technology, and populations of affluent consumers continue to grow in Brazil, Russia, India, China, South Africa (referred to as BRICS) and spread to more countries. The global distribution of U.S. corporate profit centers links economic troubles elsewhere in the world economy to U.S. job growth in two ways: through the impact of those troubles on the investment decisions of U.S. corporations and through their impact on incomes of older Americans. Adverse Impact on Corporate Investments in the U.S.
With their economic interests spread across the world economy, economic troubles outside as well as inside the U.S. reduce the funds U.S. corporations have to invest anywhere. Wherever economic troubles arise, U.S. corporations are largely free to distribute losses across multiple parts of their worldwide operations in whatever combinations they deem most profitable. In recent years rates of return on investments have generally been higher in some of the emerging economies than in the U.S., so U.S. corporations are unlikely to favor the U.S. over all other countries in which they have operations. With an eye to future possibilities, U.S. corporations may even respond to shrinking profits outside the U.S. by shifting funds from the U.S. to economically troubled regions to maintain political favor, increase the productivity of operations in those regions, and/or finance takeovers of weaker competitors. A reduction in the flow of investments in the U.S. almost necessarily slows job growth. Older Workers. Older workers see retirement coming, so they are likely to increase investments for retirement. Those with families are also likely to try to build investments to leave their children. Increases in investment activities link the spending behavior of older workers directly to economic troubles outside the U.S. because decisions about how much income to invest are influenced by stock market trends. And those trends are tied to profits earned by U.S. corporations outside the U.S. as well as those earned in the U.S.
By lowering the rate at which stock values increase, troubles outside the U.S. reduce spending in the U.S. Less spending translates into slower job growth. Retirees. The link between economic troubles outside the U.S. and the spending behavior of retirees is even stronger. Retirement brings a partial or complete shift to sources of income that are quite dependent on trends in corporate profits and stock values – social security, pensions, and government programs that supplement incomes (e.g., Medicare, Medicaid, assistance with food, transportation, and housing costs). Pensions are directly funded by corporate profits and stock values. Social Security and other government programs are funded by revenues partly derived from taxes corporate profits and taxes on individual earnings on stock portfolios. Thus, through their adverse impact on corporate profits and stock values, economic troubles outside the U.S. reduce spending by U.S. retirees and government spending on behalf of retirees. Slower job growth necessarily follows. Most economists keep looking for a much needed shift to a sustained high rate of job growth in the U.S. It probably will not come. As things now stand, the world economy is chronically unsteady, plagued by sporadic outcroppings of economic troubles (that are mistakenly defined in terms of national boundaries rather than in terms of the world economy). U.S. job growth is dampened by this global and revolving economic troubles account and will be dampened further as U.S. corporations spread their operations to even more regions of the world economy. This state of things is more likely than not to continue indefinitely, unless the world’s nations do a much better job of managing the world economy as a whole and the U.S. government does a better job of managing investments in the U.S.
Posted on March 29, 2012 March 29, 2012 by Jim LundayPosted in Global Economic Instability, One World Economy, U.S. Workforce TrendsTagged Global Corporations, Income Growth, Investment Trends, Job Growth.